Neilson, Julia (1868–1957): At age of twelve, she was sent to a boarding school in Wiesbaden, Germany, where she learned to speak French and German and began to study music at which she excelled. Returning to England, Julia entered the Royal Academy of Music in 1884 and studied the piano. 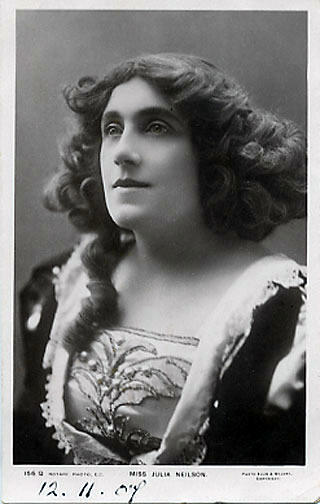 After establishing her reputation in a series of plays by W. S. Gilbert in 1888, Neilson joined the company of Herbert Beerbohm Tree at the Haymarket.